Mizkan Euro is the European subsidiary of Mizkan Group, a family-owned, Japanese business started in 1804, which is the number one sushi seasoning supplier in the world. Headed by Kazuhide Nakano, Mizkan Group is a global business with over 210 years experience in producing high quality food products. Mizkan Euro has continued this worldwide trend of producing high quality food products by recently adding UK number one brands, Branston Pickle, Haywards Pickled Vegetables and Sarson’s Vinegar to its portfolio as part of its growth plan, cementing its position as chutneys, relishes, pickled vegetables and vinegar category experts in Europe. 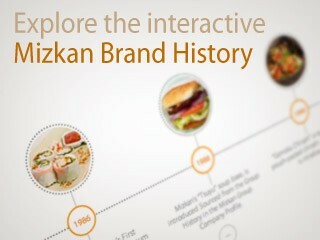 The symbol and slogan of the Mizkan Group is inspired by the Global company vision of “bringing flavour to life”. The symbol, based on Matazaemon Nakano family crest, shows three bars representing flavour, aroma and consistency, while the circle represents the perfect balance of these characteristics in each of the condiments. The Mizkan name and corporate logo reflect the proud heritage and tradition borne out of 210 years of ownership and market leadership of the categories in which it competes.